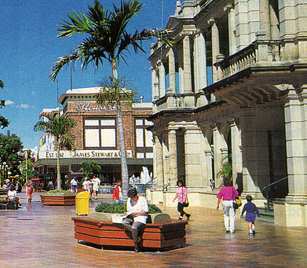 Rockhampton is a major beef industry town situated on the Fitzroy River exactly on the Tropic of Capricorn. Tthe seaside town of Yepoon is 43 kilometres away. Great Keppel Island, a continental island near the Great Barrier Reef, is offshore. The island is very popular young people's destination. Ferries depart from Rosslyn Bay, 7 kilometres from Yepoon. The town centre has a number of fine buildings from the gold rush period. 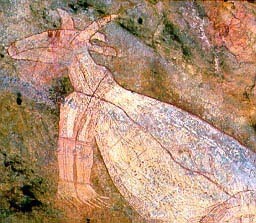 The Aboriginal Dreamtime Cultural Centre is 6km north on the highway. Rockhampton has a tropical Botanical Gardens established in 1869. North of town is the Cliff Kershaw Australian native plant garden. Capricorn Information Centre on the highway 3km south of town on the Tropic of Capricorn. Phone 492720855. Riverside Information Centre Quay St, near corner of Denham St. Phone 49225339. Open 9am to 4.30pm weekdays, 9am to 4pm weekends. YHA Rockhampton City is spacious and friendly. 60 MacFarlane St. Phone 49275288. Dorm $15, twin $34. Duthies Leichardt Hotel Corner Denham and Bolsolver Streets. $15 per person. Criterion Hotel is a grand old building. Quay St. Phone 49221225. Rooms with shared bathroom are $20 single, $30 double. Qantas/Sunstate (107 East St) and Ansett/Flight West (137 East St) fly to Rockhampton. Coach services are mainly north-south along the coast. McCafferty's also runs inland to Longreach. McCafferty's coach terminal is just north of the Fitzroy Bridge on Queen Elizabeth Drive. Greyhound Pioneer coach terminal is at the Mobil roadhouse in George St, near the corner of Fitzroy St. Cairns is 16 hours, $100. Brisbane is 11 hours, $67. Trains run north-south through Rockhampton. Phone 49320453. The railway station is at the east end of George St, 1km southeast of town. Brisbane is $72. 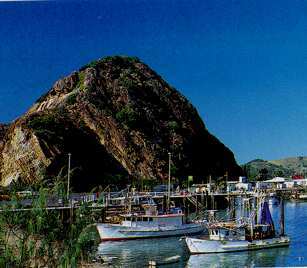 Ferries to Great Keppel Island leave from Rosslyn Bay, near the town of Yepoon, which is around 50km from Rockhampton. Consider heading west from Rockhampton to the remote Carnarvon Gorge National Park. It is a cooler ferny oasis in the dry outback. Check road conditions after rain. For further options see Great Barrier Reef complete webpage. 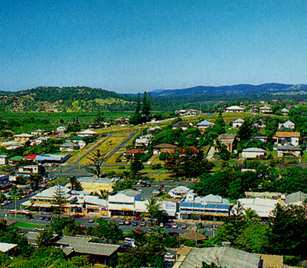 Yepoon is a seaside town 43km from Rockhampton. Boats to Great Keppel Island leave from Rosslyn Bay, 7km south of town. Young's Coaches (phone 49223813) and Rothery's Coaches (49224320) run services from Rockhampton through Yepoon to Rosslyn Bay. Capricorn Coast Information Centre is at the entrance to town. Phone 1800 675785. Barrier Reef Backpackers 30 Queen St. Phone 49394702. Dorm $15, double $33. Free pickup from Rockhampton. Free dropoff at Rosslyn Bay boat harbour. Ferries to Great Keppel Island depart from the Rosslyn Bay boat harbour. A carparking station is nearby for $4.50 per day. Day trippers can park at the boat harbour. Keppel Tourist Services runs two ferries from Rosslyn Bay boat harbour to Great Keppel Island. Reefcat leaves Rosslyn Bay at 9.15am and leaves Great Keppel at 4.30pm ($25 return or $70 with island tour). Spirit of Keppel leaves Rosslyn Bay at 11.30am and 3.30pm and leaves Great Keppel at 2pm and 4.30pm ($25 return). Phone 49336744. Koorana Crocodile Farm is in the vicinity of Rosslyn Bay. It has lots of crocs and is open from 11.30am. A 90 minute tour departs at 1pm. $10, children $5. 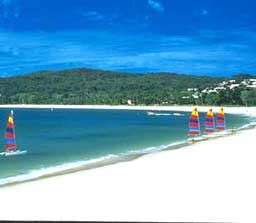 Great Keppel Island, which is 12km offshore, is a continental island. This means it is a mountain jutting out of the sea rather than a coral cay built up by dead coral. Being a continental island it is reasonably large covering 14 sq km and has 18km of beautiful white beaches to explore. Nearby Middle Island has aunderwater observatory of a sunk Taiwanese fishing junk which acts as a hide out for many fish. There are boat hire shops. Sailboards, catamarans, motorboats, snorkelling gear, waterskiing and parasailing are available. Keppel Reef Scuba Adventures Phone 49395022. Introductory scuba dives ($80), advanced dives ($100) and five day certification courses ($420). Keppel Tourist Services has daily departures from Rosslyn Bay at 9.15am to Fisherman's Beach on Great Keppel Island at 10am and continues to a pontoon for snorkelling, glass bottom boat viewing and lunch.Phone 49336744. Cost $65-$70. Daily at 12.15pm there is a cruise from Fisherman's Beach to the underwater observatory at nearby Middle Island. $10. Great Keppel YHA Hostel Phone 49275288. Dorm $16-$17. Snorkel hire and organised bushwalks and activities. Book in advance. Ask about the three night $79 deal which includes transport to and from Rockhampton. Keppel Haven has permanent safari tents for $25 per person. Bedding not supplied. Phone 49391907. Basic kitchen, barbeque, fridges. There are also 6 bed self contained cabins for $110 a double and $30 per extra person. Keppel Kamp Out has organised activities. Twin-share tents are $69 per person (or $49 standby rate) and includes organised activities, three meals, watersports, parties and video nights. Phone 49392131. Keppel Lodge has four five bed rooms for $90 a double plus $30 per extra person. Phone 49394251. Kitchen, barbeque, large communal lounge. If you are cooking your own food bring supplies from the mainland as prices at the island general store are high. There are also a number of bars and bistros on Great Keppel Island that are not too expensive. For example burgers are $5-$7 and small pizzas $10. Ferries to Great Keppel Island depart from Rosslyn Bay boat harbour. Reefcat leaves Rosslyn Bay at 9.15am and leaves Great Keppel at 4.30pm ($25 return or $70 with island tour). Spirit of Keppel leaves Rosslyn Bay at 11.30am and 3.30pm and leaves Great Keppel at 2pm and 4.30pm ($25 return). Both ferries are operated by Keppel Tourist Services. Phone 4933 6744.